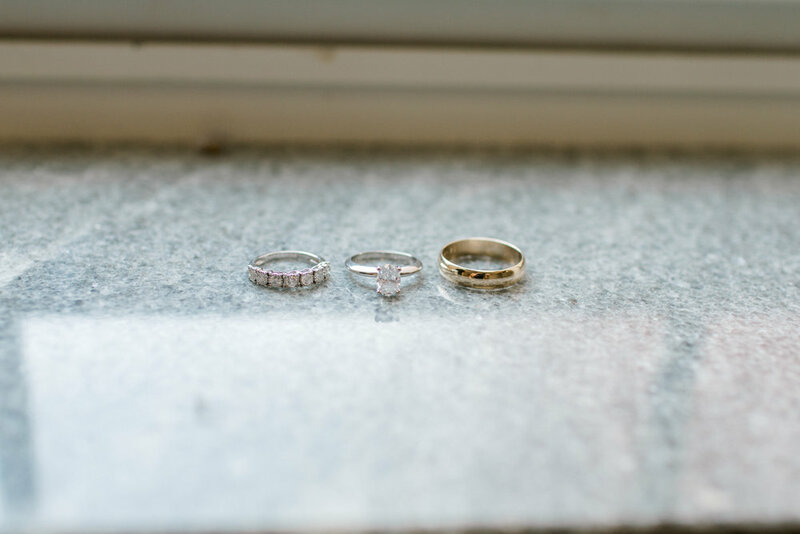 Now that we have our pictures back from our amazing photographer (Masa Kathryn Photography) I wanted to start my wedding round-up posts by showing you the small, personal details of our big day. Posts about our reception, ceremony, band, venue, bridesmaids dresses and so much more will all come in due time, but for now let’s focus on the sweet deets of our big day! For flowers, I wanted something simple and traditional. 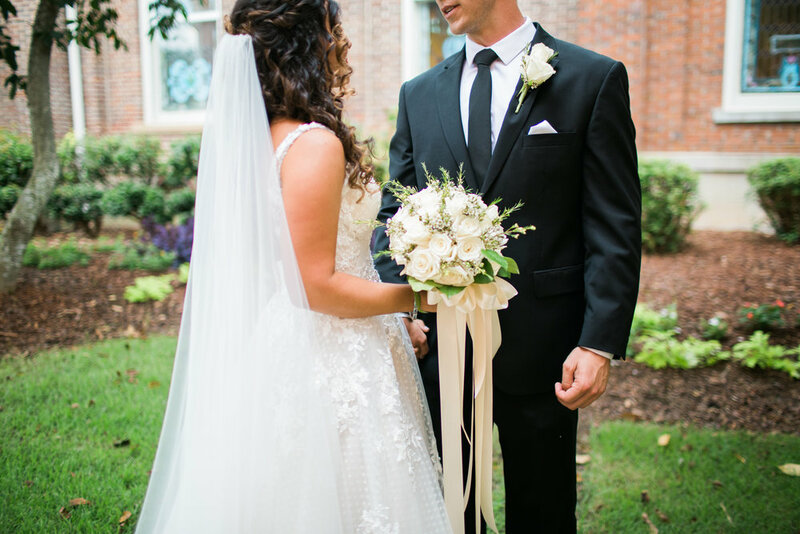 Our florist captured exactly what I had in mind and he was beyond easy to work with! I cannot recommend him enough if you are having a wedding in Mississippi. He also did all of our table settings and provided our linens. I trusted him completely! We used Keith Winchester, send me an email for his contact information. Hunter designed my rings and had them custom-made by a jeweler. If you’d like his contact information, send me an email! Hunter’s ring was passed down from his late-father, so it was extra special. I had it engraved with a special sentiment and the date. We both wanted something classic that would never go out of style and I think we achieved that! 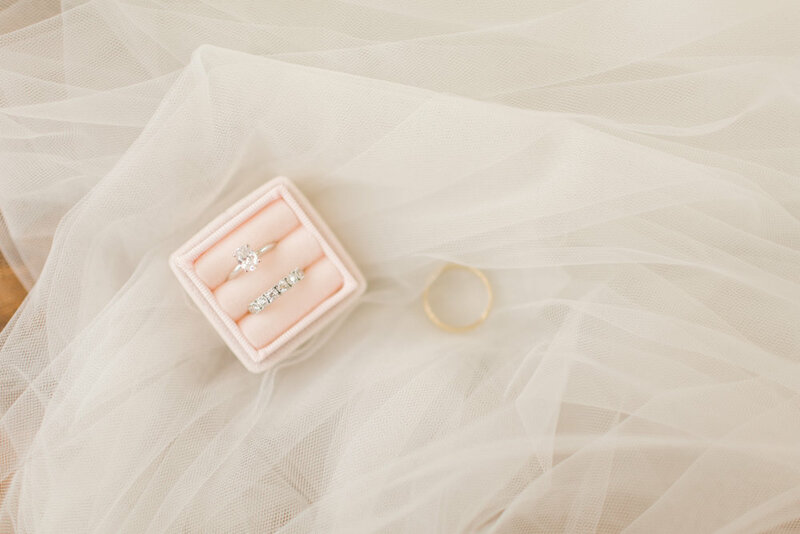 Make sure you have a pretty ring box for pictures! I had several family heirlooms that I was honored to wear on my big day. This beautiful aquamarine set came from my mom’s mom, Diana. My older sister wore these pieces on her wedding day and so I was excited to share that and wear them for mine as well. They doubled as the perfect “something blue” addition. Another piece that truly made me feel so special is the antique watch that my Pop gave my Nana on their tenth wedding anniversary in the 1950s. 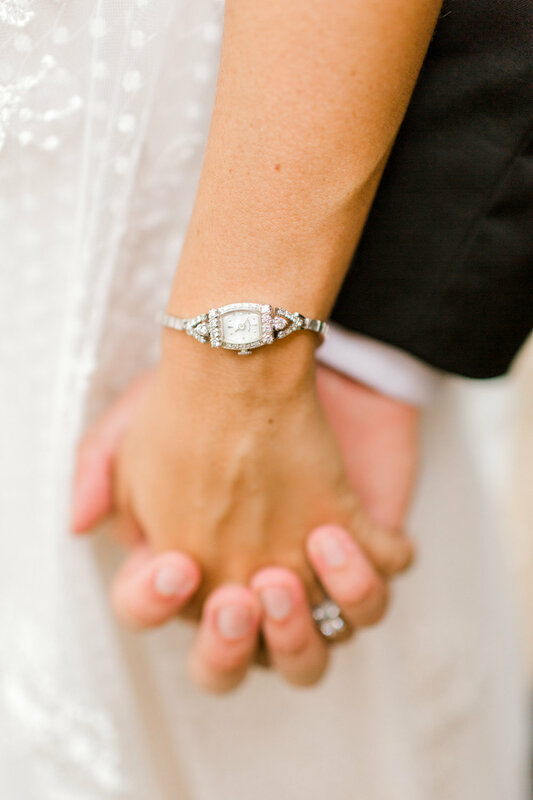 He is no longer with us, so having this watch on my wrist was a way to include him in our wedding day. I thought I was just borrowing this piece from my Nana, but she gifted it to me and I am beyond excited to hand it down to my own daughter (God-willing) one day. My earrings came from It’s a Date, the store where I purchased my dress. Since I have so much hair, I wanted something dangly that could be seen in photos. The pearls matched the pearl details on my dress and they were really light and comfortable throughout the day. Traditional simplicity is what I had always envisioned for my wedding invitations. I wanted something that I could frame and have in our home for years to come. I used Too Many Invitations, out of Yazoo City, MS and their team was so easy to work with! They invited my mom to their home and discussed all of the options and pricing with her in person. She got to see and feel the exact paper and everything! That was so nice, because she knew what to expect, which would be hard if you ordered online. You’ve gotta love a small, locally-owned Mississippi business with that unmistakable southern hospitality. Thanks, TMI, for the gorgeous invites. Comfort is KEY! I wore these Badgley Mischka look-a-likes all day and then changed into these Tory Burch sandals for my reception. I am glad that I got these sandals because I wore them almost every day on our honeymoon. In my heels, I felt classy and fancy but was still able to walk! I would suggest getting something with a thick heel like this so that you aren’t worried about falling off of your heels when you are walking down the aisle. A strap around the ankle adds some extra comfort too! I almost completely forgot about this teeny detail. Thank goodness I found an Etsy shop with rushed-delivery because I love the way the pictures turned out with the dress on them. Hunter and I did the traditional wedding vows during our ceremony, but we wrote each other letters in these vow books to exchange during our first look before the wedding. It was really special to have this time together and have such a good keepsake from our wedding day. 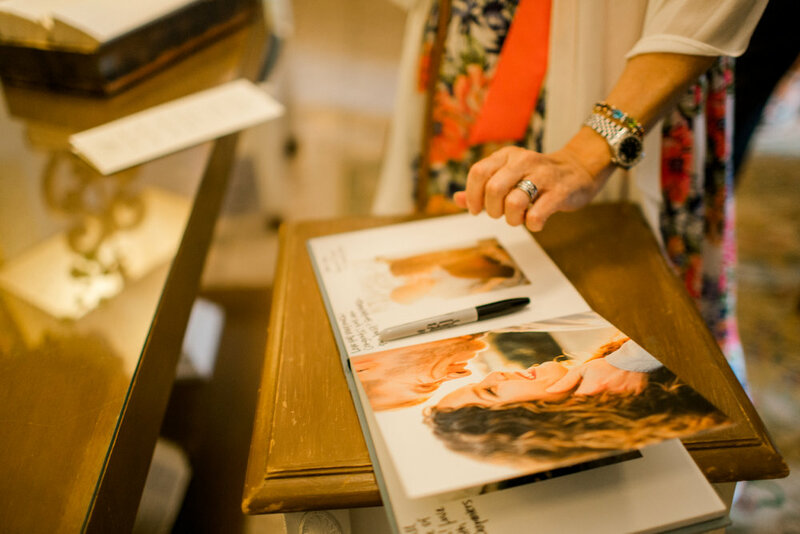 Seniman Calligraphy created these vow books, and you can even get the customized! I’ve always liked to write and I have almost always kept a journal. When I was thinking of a gift to give Hunter on our wedding day, I started thinking about writing him something special, then I realized I already had. In my journal from my junior year of college I had written all about when we had our first date, when we became official and the way that he helped me through my mom’s cancer diagnosis. I have never written about a boy in my journal before so I felt extreeeeemely lame, but it worked out for the best ;) I even had a prayer I had written down asking God to allow me to marry him…this was 5 months after we started dating, which happened to be almost 2 years to the day of our wedding. I couldn’t believe a.) that my journal was so middle-school-girl-with-a-crush-ish and b.) that i still had it! So I bookmarked the page with a note saying that I had known from day 1 I wanted to marry him and how glad I was that God had fulfilled my prayer 2 years ago. It was very senti. Now you know how mushy I truly am. Side note: Thanks to my mom for gifting me a pretty journal my junior year. I’m glad I wasn’t still using my MSU spiral notebook. It wouldn’t have photographed nearly as pretty. I am biased but I loved my dress..obvi! Of course I thought it was pretty, I picked it out after all. But the best part was that I was SO comfy in it! I was able to sit, dance, eat and drink in it without worrying if it would fall down, ride up or rip. I cannot say enough how important it is to be comfy in your dress! 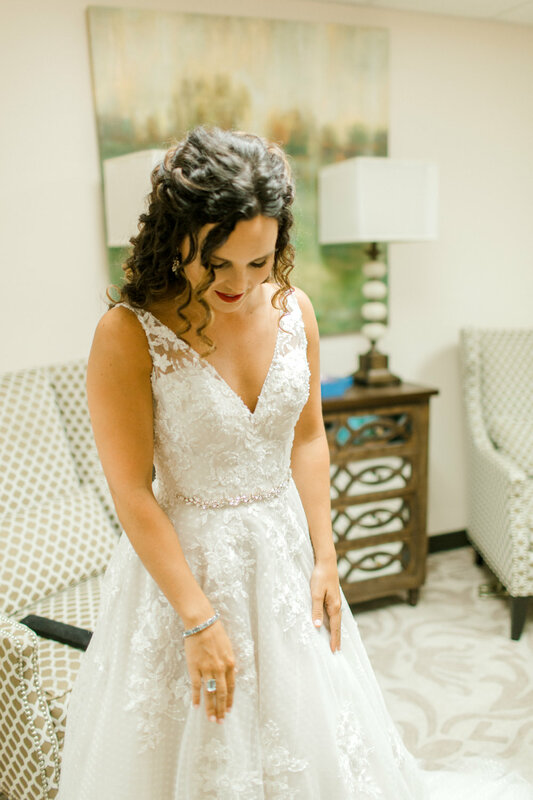 My dress is by Maggie Sottero. I guess now is a good time to tell you about my veil. I wanted something simple but LONG bc #drama! So I chose a raw edge cathedral length one. It stretched waaaay out behind me when I walked down the aisle and I’m all about a statement so that is exactly what I wanted. I got my gown and veil at It’s a Date in Starkville, MS. It was super convenient since I live out of state and my mom could stop in to pick up my accessories and everything in our hometown, but there are lots of great bridal stores in MS. I would also highly suggest The Bridal Path! If I lived closer to Jackson I definitely would have shopped there too! This was the part of our day that I was most nervous about as far as appearances go. Since my hair is super unruly and unpredictable, I had no idea how it would turn out! Brinley Perrigin, at Avant Garde in Starkville, MS absolutely crushed it. I wanted my hair to look natural and whimsical and she brought my idea to life! I didn’t want anything crazy, poofy or out of my normal look. 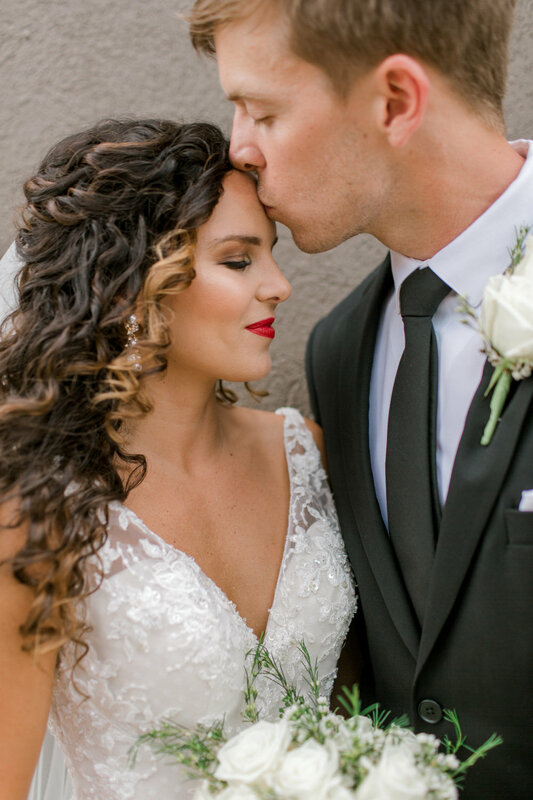 She made my curls look polished and pretty, exactly what I was going for. I was so relieved and asking her to do my hair was one of the best decisions ever! She is so sweet and talented. Thank you, Brinkley! I had a little hair piece to put in for the reception once I removed my veil buuuuut, I broke it down during our first dance and it flew into the crowd. So I said, “ehhh who cares” and didn’t bother putting it back in. 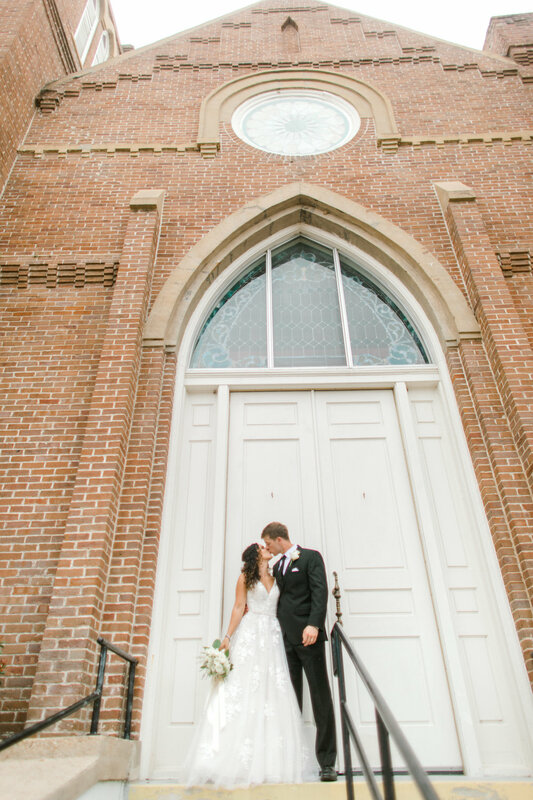 We got married in my childhood church, First Baptist Church of Starkville. They have a gorgeous chapel, but our guest list was too big so we had the ceremony in the sanctuary, which was perfect too! My center-aisle dream died but now I realize that small detail doesn’t matter in the slightest! Another easy, simple element. My friend Morgan Lewellen makes these beautiful wooden signs for tons of different events. You can rent or purchase them. We had this one outside the church to welcome guests as they arrived. She made us several other signs that were inside the church. I toyed with the idea of doing a modern guest book. Something like a wooden R, a globe and several other more contemporary takes on the traditional guest book, but I kept going back to this one! Artifact Uprising has the most beautiful books that are totally customizable. I chose the lay-flat option in blue with gold writing. We filled it with images from our engagement photos and were so happy with how it turned out! I can’t wait to order another one with all of our wedding photos! Morgan Hopper did my makeup and I was so happy with it! Of course, I had to go with a red lip because red lips are like my THING and I love them. The color is Fly Girl by Lipsense. It stayed on all day and was such a nice pop in pictures. I have no clue what all Morgan used but she gave me cheek bones magically so I was on board! We did Fashion Board together at MSU and she is super talented! I was so pleased with how everything turned out. I wanted dramatic but I still wanted to look like myself. She pulled it off. Thanks, Morgan! The thing you need to remember above ANYTHING ELSE, is that all of these details really don’t matter. Sure, they are fun to plan and exciting to see come to life, but they are so insignificant. 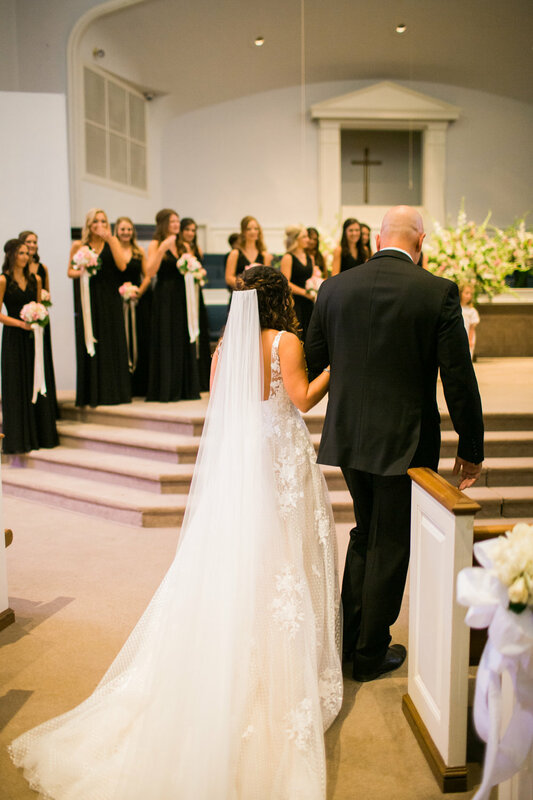 The person at the end of the aisle is what you are truly doing all of this planning for. So remember to go with the flow and take things as they come. 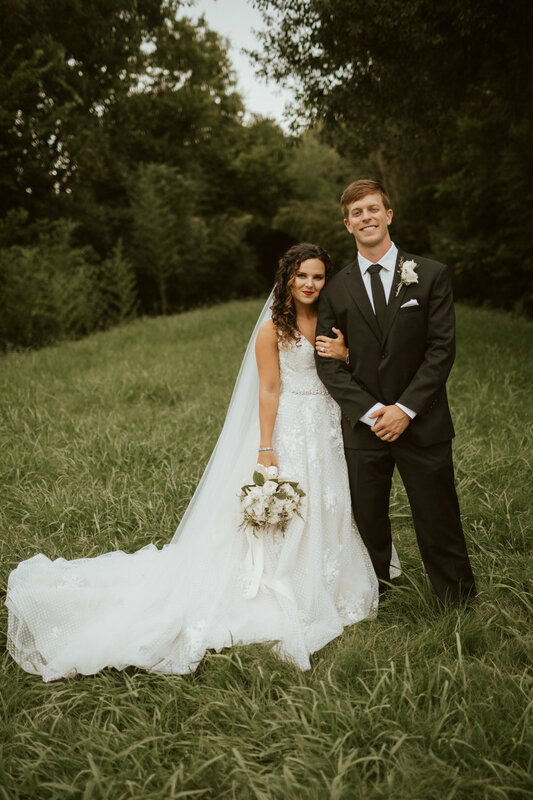 If the air conditioner is broken in your limo (yep), you are 45 minutes late to your own reception (yep) or you forget to give your parents and in-laws their gifts (yep), just know that none of that will even be a blimp on your radar when you focus on what really matters: your groom! Good luck with your planning and feel free to send me an email to get more information on anything I shared in the post!